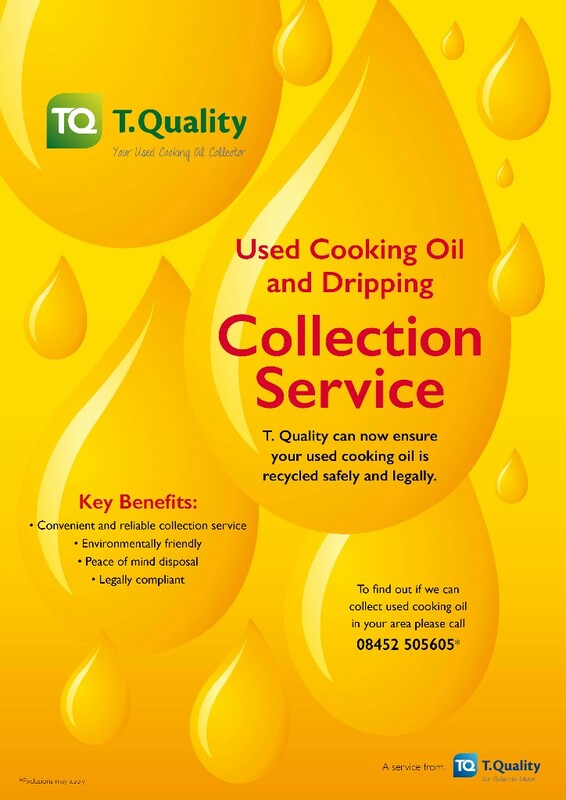 T. Quality are proud to announce that our free Used Cooking Oil & Dripping Collection Service is fully operational throughout most of the UK Mainland. Call 08452 505 605 to find out more about our collection, safe disposal and waste oil recycling service. We are able to collect used cooking oil, waste dripping and waste oils and frying fats from your Fish & Chip Shop, Indian Takeaway, Chinese Takeaway, Restaurant, Pub, Club, Amusement Park, Cafe, Kebab Shop, Pizza Shop, Southern Fried Chicken, Supermarket and Mobile Catering Units. Recycle your waste cooking oil and used dripping fat. If you have waste cooking oil or waste dripping fat, we will collect the used cooking oil using our dedicated vehicles and supply you with all relevant paperwork to ensure you are legally compliant. Waste cooking oil disposal and used cooking oil recycling is so simple with T.Quality. Your used cooking oil will be recycled into renewable energy helping to save the planet. Simply call 08452 505 605 or email customercare@tquality.co.uk to arrange a used cooking oil collection and we will do the rest. Collecting your used cooking oil and waste dripping fat couldn't be easier!